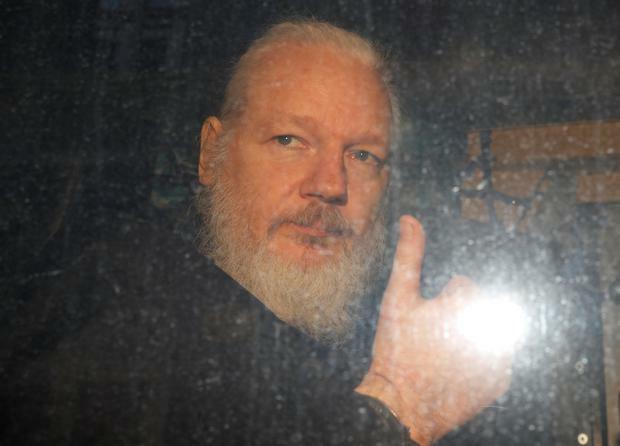 Assange, arrested by British police in London and carried out of Ecuador’s embassy there, faces a maximum penalty of five years in prison on the American charges, the U.S. Justice Department said in a statement. His London arrest paved the way for his possible extradition to the United States. It was triggered in part by the publication by WikiLeaks in 2010 of hundreds of thousands of U.S. military reports about the wars in Afghanistan and Iraq and American diplomatic communications. The Justice Department said Manning had access to the computers as an intelligence analyst and was using them to download classified records to transmit to WikiLeaks. The Obama administration decided not to prosecute WikiLeaks and Assange on the grounds that the work of the website was too similar to journalistic activities protected by the U.S. Constitution’s First Amendment. Special Counsel Robert Mueller also underscored the role of WikiLeaks in his 22-month investigation into Russia’s role in the 2016 U.S. election. The website published emails damaging to Democratic presidential candidate Hillary Clinton that Mueller and U.S. intelligence agencies have said were stolen by Russia in a bid to boost Republican Donald Trump’s candidacy. The Justice Department said Manning and Assange engaged in real-time discussions concerning Manning’s transmission of classified records to Assange in which Assange encouraged Manning to provide more information. But Trump praised the group during the 2016 presidential race. At a campaign rally shortly before the November 2016 U.S. election, Trump said “I love WikiLeaks” after it released the hacked Democratic emails that harmed Clinton’s candidacy. Assange, who took refuge in Ecuador’s London embassy in 2012 to avoid extradition to Sweden in connection with a sexual assault investigation, has said he does not know where Democratic Party-related emails WikiLeaks published before the election originated, though he has said he did not get them from Russia. The fact that the United States was pursuing charges against Assange emerged in November, when a document errantly filed by federal prosecutors in Virginia in an unrelated terrorism investigation indicated that he had secretly been indicted by U.S. authorities. The indictment was issued in March 2018, a U.S. law enforcement official said.